Bhopal is not yet at peace. Almost three decades have passed since the 1984 gas disaster, caused by the American corporation Union Carbide – now DOW Chemical – but many families are still trapped inside a nightmare that began on that distant night. Half a million people were exposed to the toxic cloud released from the plant. Thousands died within a few weeks from exposure. ￼Presently, a new disaster is taking place in Bhopal: around 100,000 people are chronically ill from the effects of the leak, and dangerous waste has penetrated the underground aquifers widely used for drinking water, harming the health of nearby dwellers. As a grim result, children are increasingly faced by severe neurological and physical disorders. Since the 2001 acquisition of Union Carbide by DOW Chemical – for a staggering 11.6 billions USD – the American corporation has single-handedly refused to accept any responsibility. 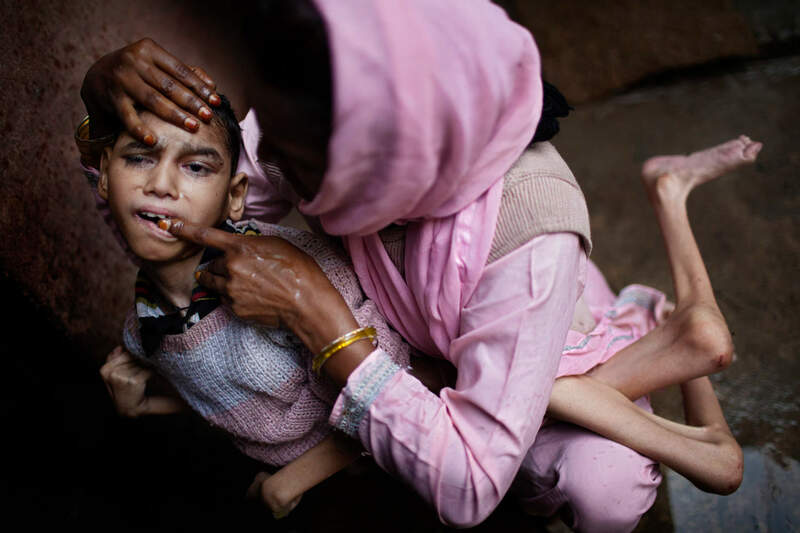 An on-going lawsuit against DOW Chemical in the USA – sponsored by The Bhopal Medical Appeal and other groups of ‘gas survivors’, is pending before the Court of Appeals in New York. It seeks damages for injury, medical monitoring and mitigation. Paradoxically, DOW Chemical has been awarded a ten-year contract to sponsor the Olympic Movement until 2020. While documenting the on-going health crisis in Bhopal, I strived to portray my subjects with intimacy, meaning and depth. I aimed to present images that would convey emotion, and inspire our sense of compassion, brotherhood and justice. I struggled to understand and ‘feel’ the suffering of the affected children and their families. I then allowed it to intimately lead me when it was time to find expression through my images. In Bhopal, I have met many genuine and welcoming individuals who hold life dear to their heart, and only wish for a better future. They too have inspired me to continue returning to this city, and promoting awareness about the neverending injustice bestowed upon its people. IPA PHOTO ESSAY ASIA AWARD 2013 2ND PRIZE WINNER.